Telcos have offered customers Digital Subscriber Line (DSL) solutions for decades. DSL provides digital communication to the customer premises over copper local loops originally intended for analog telephony (POTS – Plain Old Telephone Service). This was a big improvement compared to the analog alternatives. The first DSL solutions connected central offices and customer premises. However as FTTx (Fiber to the “something”) solutions emerged, the telcos could deliver very high speed digital signals to the end point of the FTTx network – and then use DSL solutions to send the signal the rest of the way to the customer premises. This shortened the DSL part of the connection, enabling higher communication speeds. 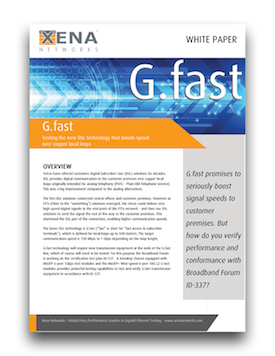 The latest DSL technology is G.fast (“fast” is short for “fast access to subscriber terminals”), which is defined for local loops up to 500 meters. The target communication speed is 150 Mbps to 1 Gbps depending on the loop length. G.fast technology will require new transmission equipment at the ends of the G.fast line, which of course will need to be tested. For this purpose the Broadband Forum is working on the certification test plan ID-337. 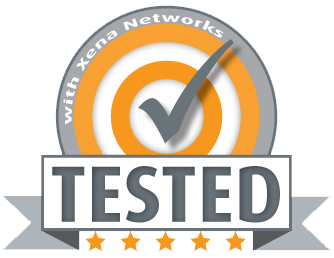 A ValkyrieBay chassis equipped with Odin-1G-3S-6P 6-port 1Gbps test modules and the Odin-10G-1S-6P Wire-speed 6-port 10G L2-3 test modules provides powerful testing capabilities to test and verify G.fast transmission equipment in accordance with ID-337.